Paul and I met during Welcome Week in college. One of the first road trips we took was to San Antonio, to watch Baylor play in the Fiesta Bowl. I immediately fell in love with San Antonio - with the sights, the people, and the food. We walked all over the city, until my feet couldn't take another step. We ate at a quaint little restaurant overlooking the Riverwalk and watched the boats floating by. I loved the authentic Mexican food, which was very friendly on the college budget. While Mexican food is available in Virginia, it just can't touch the tastes of Mexican cuisine in San Antonio. I would love to return to Texas and take my boys to San Antonio. How they would delight in this wonderful city. If we went, I'd use SAVE – San Antonio Vacation Experience to find the best deals on hotels, museums, and other attractions. First, I'd book the San Antonio Riverwalk Marriott, where SAVE rates range from $119-$249 (they have many other hotels too, but I like Marriotts). Other deals I would snag are 20% off the Children's Museum, $1 off Ripley's Believe it or Not (Paul and I went there on our trip, so I'd want a repeat visit! ), $2 off Alamo trolley, $2 San Antonio Botanical Gardens, multiple discounts for Sea World, and $2 off Schlitterbahn (which is not in San Antonio, but I made a trip there with my roommates each summer during college). One thing I remember so well about our trip was that even though it was January, it was a balmy 80* outside. Since Paul and I were both from states further north, we delighted so much in this. I hope that one day we are able to return with our boys and enjoy touring the city as a family. Be sure to check out all the Limited Time Offers you can score for travel to San Antonio, and follow @SAVEinSA to find out when new deals become available! 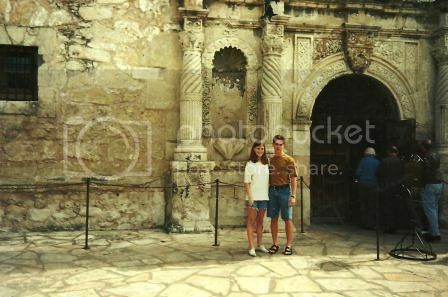 All pictures are my own (circa January 1994) except the image of the Alamo above. It looks so idyllic, now I want to go visit! 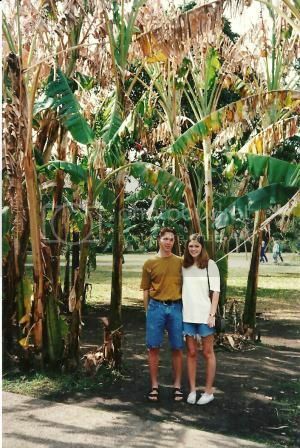 nice memories, I love looking at pics from the past..
Awwww... how cute you two were... ARE. Sn Antonio looks like such a fun place to go. We love Mexican food and that River Walk looks like some place I would want to check out. If you happen to have any zucchini recipes on your blog, link them up here. This sounds like a wonderful trip! I have never been there, but it sounds like a wonderful place to explore. Looks like a gorgous place! Love the river scene!! San Antonio is fun. I hope you make it back! You might want to check for a virus in your email. I just opened up an email from you and it had some funky link which I did not click on. I did not send this through your regular email, in case it is messed up. One of my biggest regrets was not going there while in Texas. Looks so charming! Truly, that's the only place in all of Texas that interests me at all. That's a city in which I definitely want to spend some time! What great memories of San Antonio! I was there for the whole month of March, 2001. I agree, it is a great place to visit. i like san antonio, too. has a great 'feel' to it. I would love to visit San Antonio. The photos are beautiful! It does sound like you have great memories of San Antonio. I hope you get to take your boys there one day. Stuart has been to San Antonio twice and loves it, and my parents went just last fall and want to go back again. They had been years ago and got to the Alamo just as it closed for the day, and so finally got to visit it this time. Between what I have heard from Stuart and my parents, and seeing your pictures-I think I'd like San Antonio too! SO COOL you have all those pics from your trip! Looks like an awesome place to visit. I love San Antonio! You guys look so young and happy. Great photos. They make for nice memories. Can you believe I have never been to San Antonio in alllll he years living in Texas. 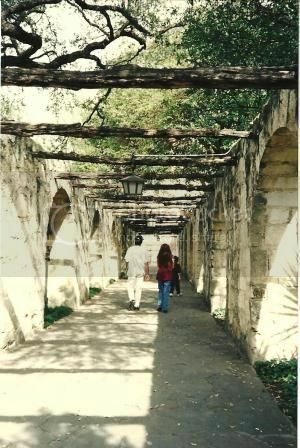 Lisa, I've been there too (in 07) and i loved the reverence at the Alamo. We were too late to get admittance into it, but the grounds had a reverent hush. love it. The Riverwalk is so unique, huh? We had the best fish dinner there, yummmmy memories. Have not been there, but sure enjoyed your photos. Perhaps someday.....!!! Love all of the pictures... You and hubby were just a couple of kids!!!!!!! I know what you mean about real Mexican food. I lived in Texas for 12 yrs. --and have struggled with Mexican food since coming back to TN... It's just not the same! What wonderful memories for you both! Such wonderful memories and really sweet photos. 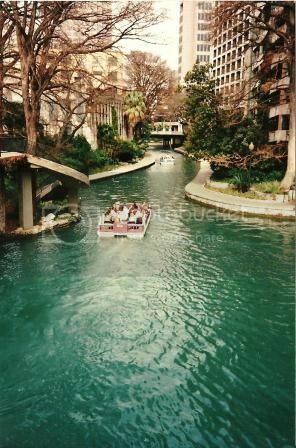 I've never been to San Antonio, but your pictures make me want to go...especially in the dead of winter! You two look so cute! You guys look like a couple of kids in those pictures! I've been to Dallas but never for long. I love those desert states and would love to take a family vacation there too.